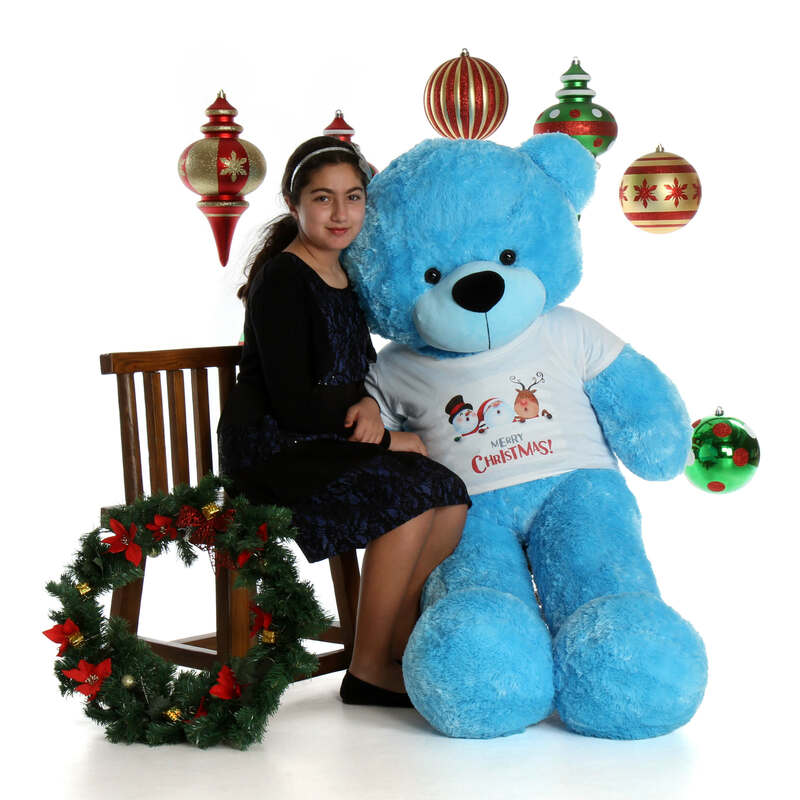 We want you to be happy this Christmas and we think our huge life size 60in (5ft) teddy bear Happy Cuddles is the perfect gift idea! Happy is a beautiful shade of vibrant light blue, and he is so cuddly soft (we’ve had to ask the Elves to stop hugging him so they can get more work done.) He has big dark eyes, a chubby black nose, and a big happy smile on his face. Happy is wearing our cute ‘Merry Christmas’ shirt design featuring a snowman, Santa and Rudolph. Happy Cuddles wishes you a Beary Merry Christmas! The custom shirt is specially sized for our 5ft (60in) Happy Cuddles teddy bear, and is washable and removable. The design features a snowman, Santa, and Rudolph over the text, ‘Merry Christmas’ on a white background. Don’t forget the greeting card! Type up to 70 words in the “Card Message” box and we’ll print it inside one of our custom Giant Teddy full size greeting cards and tuck it in the box with Merry Christmas Happy Cuddles.